Hi Interior Collective readers! I’m Whitney Jones, an interior designer and stylist that loves coming up with creative solutions for small spaces. Today I’m taking you into my own kitchen renovation- just wait until you see the transformation. The home was built in 1983 and was well taken care of. We’re actually the third owners – the first owners built the home and the second ones were related to them! But, even though our home was in great shape, many of the finishes were outdated, especially in the kitchen. We knew when we viewed the home that the kitchen would be the first room we’d tackle. Our kitchen could definitely benefit from a full gut job, but at the time we were not prepared for a full renovation. The cabinets are solid wood they’ll hold up well with fresh paint until we’re ready to completely renovate this kitchen by moving some walls and adding natural light. The first thing we did was remove the drop ceiling and cabinet that was meant to go over the fridge. I’m a huge color lover and would love to have added color to the lower cabinets, but because I wanted to brighten our small space, I painted the cabinets in a semi-gloss white finish (Benjamin Moore’s Chantilly Lace). The white is a temporary fix, but looks amazing and will be perfect for the next couple years until we’re able to make more structural changes to the kitchen. I updated the hardware to these long nickel bar handles that help modernize the kitchen. One of the biggest changes we made to the kitchen was switching from ugly beigey-yellow laminate counters to beautiful creamy gray quartz Caesarstone counters. We wanted countertops that were durable, beautiful, and neutral (in both style and color). The Caesarstone London Grey countertops are absolutely amazing! They’re easy to clean, scratch-resistant, stain resistant, and non-porous, perfect for preparing a quick meal right on top of the countertop! I dreamed of a penny tile somewhere in my home and thought it would be on a bathroom floor. But, I found this really pretty gray penny tile and had to have it for my kitchen backsplash. It was the perfect accent to bring some contrast to the cabinets and countertops. One of the other great things about our mini-reno is that I was able to update our sink to an extra deep 11” sink from the 6” depth sink that was original to the kitchen. Seriously, our new sink has been a GAME CHANGER! Things like this might seem small to most people, but if you’ve gone from a 6” sink to a 11” sink, you’d be excited as well! Our dishwasher, vent hood and range that were already installed were new, but we did get a new fridge that I love. The floors were updated from the brown speckled epoxy finish to gorgeous (and inexpensive) gray, glazed porcelain tiles. We thought about bringing in the laminate wood floors that we installed in the rest of the home (especially since we found out they were safe for wet rooms) but knew that we’d rather a less fussy floor that works well with a messy Husky and Maltipoo. I’ve been searching for a while for a wide runner for this space, but in the meantime, I’m working with this cute little rug in front of my sink that brings in a some much-needed color to kitchen. Did you notice that I’ve also removed the cabinet doors from the two upper cabinets to the left and right of the window? This was really important to me as I feel like all the uppers made this small kitchen feel closed in. I love being able to display my dishware and glassware. Having this open storage makes me want to collect pretty pieces to put here- and makes me want to keep my kitchen extra clean! I fell into a lot of issues during this little renovation, which mostly related to contractor issues, but now that it’s done, I’ve been having a blast in my “new” kitchen. I’ve cooked more these last few months than I’ve done my whole life because I love being in here so much. I look forward to more updates in the future, but for now, my kitchen is really pretty and works perfectly while we update the rest of the home. I can’t wait to see where this kitchen evolves in 2 years. Kitchen banquettes are the perfect opportunity to bring in casual, functional style to a kitchen. They’re perfect for the morning coffee, homework, or a delicious dinner for the entire family. You can design a banquette to be a neutral counterpart in your kitchen or have it stand out with bright colors and textures, making it the star of the room. This stylish banquette (below) uses lots of color, pattern, and texture. The sparkly chandelier above the table mimics the movement in the pillows, making this the most fun place to eat breakfast. I can imagine this corner was designed to inspire a creative family. This banquette is framed with lots of cabinets, making this kitchen a dream for someone in need of storage. The nook takes advantage of the large windows, providing lots of natural light and a beautiful view to the trees outside. Burnt orange cushions and pillows bring in a bold pop of color against the neutral built-ins. If you’re an avid reader or do a lot of work from home, this lively, comfy banquette is the perfect spot for the work-at-home entrepreneur or for the kids to do homework. Sitting right next to large kitchen island full of seating, this banquette is also perfect for entertaining. Design by SDG Architecture, Inc. This bright, cozy corner features pretty, patterned pillows and matching fabric shades. You don’t have to have a large table to have a functional, stylish banquette. The round, black table, linen upholstery, and wood floors give off romantic vibes. The sparkly chandelier and tufted banquette exude glamour in this luxe kitchen and provides a comfy place for the family to gather any time of day. A neutral scheme with shimmery texture adds to this nook’s sophisticated appeal. This large, classic kitchen features a gorgeous banquette along the window, providing multifunctional seating for at least eight people. It’s a great spot for holiday dinners, breakfast for slumber parties, or game nights with the entire family. Whether you’re an avid reader (while spending lots of time in the kitchen) or just love to collect cookbooks, housing your favorite books in your kitchen make for a fun, decorative, yet functional, display. These built-in shelves housed next to the refrigerator take advantage of the tall ceilings without taking up too much space, both physically and visually, keeping the kitchen from looking cluttered. Although these shelves hold a lot of books, they can also be utilized for decorative glassware and vases. This short bookcase built into the kitchen island is a simple, stylish way to store and display books. The bookcase doesn’t take much room and is easily accessible for anyone in the home- especially if you use your children as little helpers in the kitchen. 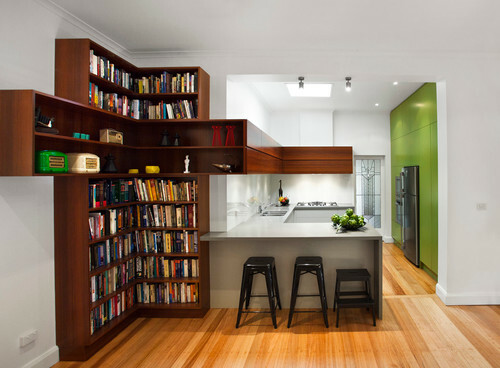 This bright, beautiful modern kitchen below features a standard bookcase design for housing kitchenware, accessories, and books. Although it looks to be a custom design in this kitchen, you can get the look with a store-bought bookcase- just add a molding. 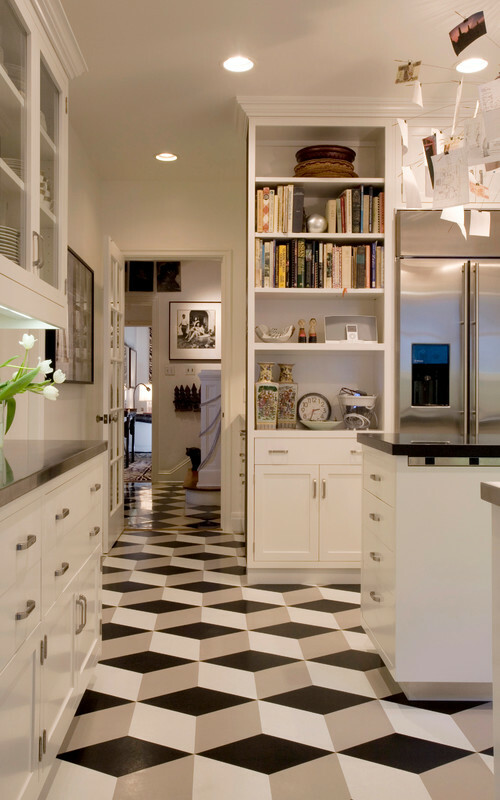 If you have a very extensive book selection, you can take notes from the modern kitchen below. It features a large, free- standing bookcase that’s accessible in two rooms. The shelves appear to house only books, but you can definitely utilize all this extra storage for china, glassware, a minibar, and decorative accessories. Bamboo and cork are my favorite earth-friendly flooring materials great for both kitchens and baths. Cork is soft on the foot, sound absorbing, hypoallergenic, and resistant to mold and mildew. Bamboo is fast growing, long lasting, and durable. When bamboo is harvested to make floors, the plant isn’t killed- the roots remain intact so new shoots can grow. Both bamboo and cork come in a wide range of beautiful colors and styles. Going “green” in your kitchen and bath can extend to your countertops too. There are so many options that are beautiful, durable, and gentle to our planet. Butcher block is a popular eco option because not only does it look great, but it can last a very long time. You can cut on it and after you’ve accumulated enough scratches to show its age, you can sand your butcher block counters down, seal them, and have a whole new look and feel. Other eco-friendly countertops are bamboo, recycled glass, stainless steel, concrete, and even Caesarstone, which is dedicated to minimizing the environmental impact throughout the production process. LED lighting is your best bet for saving energy throughout the house, but because of the initial costs of LED bulbs, homeowners are hesitant to invest in them. LED lightbulbs consume 80% less energy than incandescent lighting and last 25 times longer. If you’re unable to make the change to LEDS, CFL bulbs (compact fluorescent) are also a good substitute to incandescent lighting. There’s a large selection of EnergyStar appliances that you can choose from. Appliances with the EnergyStar label mean that they have met government standards for energy-efficiency. That’s just a start, though. New technology has paved the way for amazing features like the ability to use renewable power, less energy usage, and magnetic induction on cooktops. Low-flow toilets, showerheads, and faucets can pay for themselves in just a few short years and have a very positive impact on the environment. They cut down on water bills and make your home more environmentally friendly. There are also plenty of dishwashers and washing machines to choose from that will save water. Although they can be costly, tank-less water heaters are a great investment for an eco-friendly home. Tank-less water heaters last up to 20 years, while regular water heaters last between 10 to 13 years. They are also a large space saver, being much smaller than the bulky, traditional water heaters. By choosing salvage materials for your kitchen and baths, you cannot only save money, but also save materials from being sent to landfills. Flooring, countertops, appliances and more can be found at salvage stores and could be used to bring character to kitchens and baths. Beautiful kitchens are all the rave these days, but function still trumps beauty when it comes to these hardworking rooms. 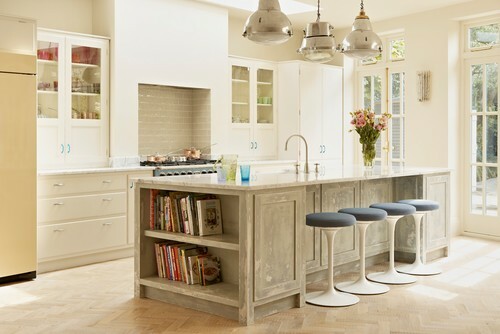 Whether your kitchen is large or small, storage is usually at the forefront with designing them. Sometimes you have to get creative when providing storage in a kitchen, so here are 6 unconventional storage ideas you can implement in your own kitchen. Barn doors are trending in every room, usually replacing interior and closet doors. But, barn doors can also be a cool way to hide shelving used to store items you want to keep out of site. They can be really stylish, serving as a complement or contrast to your homes architecture. 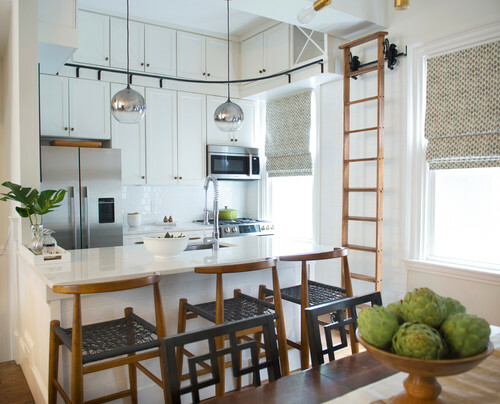 We see cabinets hung high all the time, but many times the cabinets only go high enough that they’re still reachable by a small stool or ladder. When you have really high ceilings, consider placing your cabinets to the tip top of the ceiling and having a sliding ladder system installed to make it a breeze to access your cabinets. 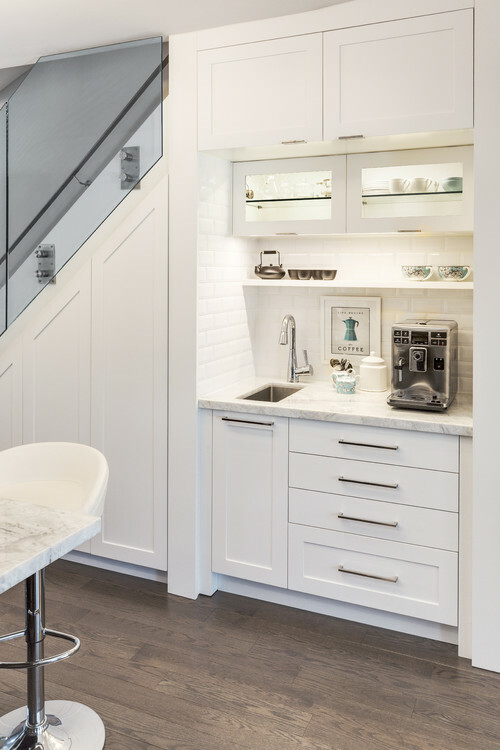 When you find yourself short on space and have a kitchen that opens up to your staircase, use the space under the stairs for open or closed storage. In the kitchen below, the space beneath the stairs was carved out for a fancy coffee station, but you can do something similar to store your pots and pans, a baking station, your china collection, or anything else you’d like to display or hide. I’m sure you’ve seen cabinets made to look like pieces of furniture in kitchens before, so why not bring in an actual piece that you would normally use in a dining room, bedroom, or living room. Like this huge hutch below. It’s a perfect piece for displaying/storing just about anything: dishware, cookware, baking supplies, collectibles, etc. Armoires, dressers, and bookcases could work in a kitchen, too. Pantry pull-outs are especially useful, but there are many kitchens with only one or two of these pull-outs and a separate pantry. 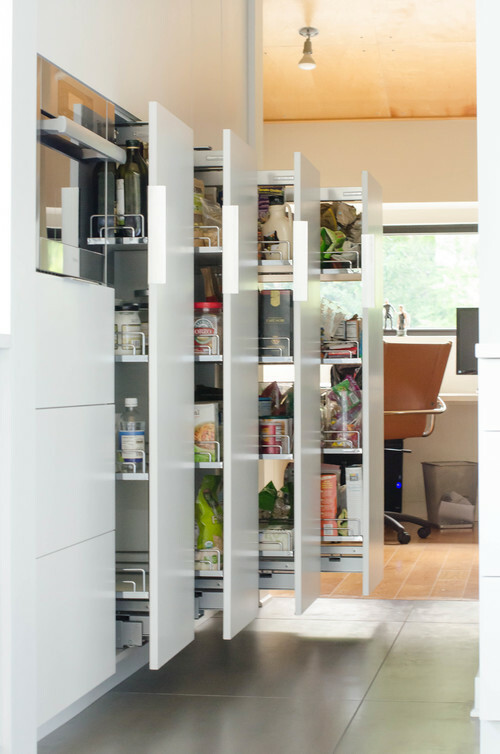 The pull-outs are usually reserved for cookware or spices, but what about taking a play from this kitchen’s playbook and doing a full pantry of pull-outs? 5-6 pull-outs could house food, dishware, cookware, glasses, spices, and more. They’re extremely convenient and make great use of both large and small kitchens. This option is extra creative and versatile. When you’re short on space in a small home and your kitchen opens up to your living room (or bedroom, for the studio dwellers), sometimes you want to visually separate the spaces. 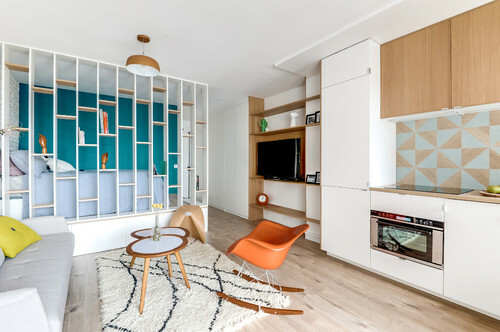 Using a room divider that doubles as storage is perfect for calming a small and crowded space, while also serving as a cool way to store fun collectibles, books, or home/kitchen essentials. When designing your kitchen storage, remember you can utilize every space of your room! Share your storage ideas with a comment below! Art is a great way to express your personality, style, and mood. I find the most interesting people have the best art collection, and a well-curated one can set the perfect mood in your kitchen or bath. Whether you want your room to be a place for day-dreaming, giggles, or thought-provoking conversations, art can do just that. Get inspired to create your own gallery of creativity with these stylish kitchens and bathrooms. The use of metallic and bold framed art can add a touch of vintage to your bathroom. Use white fixtures and neutral wall colors to tone it down and keep it looking modern and fresh. The art will pop! Art can liven up and add personality to any space. In this quirky bathroom, the large photo of the woman in goggles and the surrounding eclectic art creates a feel-good atmosphere. The use of black paint in the bathroom is a bold choice and not for the faint of heart. The addition of fun animal art in this sophisticated bathroom complements the black and white color patterns so as to not be too hard on the eyes. This kitchen design is classic, with its black and white color palette and pops of red and green. The large art is curated to fit the space and is the perfect addition: sophisticated with a classic color scheme. The gallery of art in this farmhouse kitchen creates a light and airy space. The island wrapped in wood planks and the vintage drawer handles further accentuate this design style. Here’s another bright, colorful kitchen. The large art piece makes a huge statement and looks great atop this banquette. It’s always a good idea to pull colors from your art and use them around the room. You can easily change the ambience of any room by simply putting new art on the walls. Use it as inspiration when creating your color schemes and choosing design elements. Carefully consider how you want to feel when you walk into a room and make your choices that way. If you’re already lucky enough to have a great collection, move some pieces around your home to create a new experience for you and your guests. A luxurious room is one that exudes glamour, fine materials, comfort, and exclusiveness. The kitchen above, for example has a large expanse of cabinets that just from first glance looks to be very convenient for the home dwellers. You can clearly see that the designer went above and beyond with the details in the design of this kitchen. From the sparkly pendants to the ceiling, each intricate detail is luxurious. 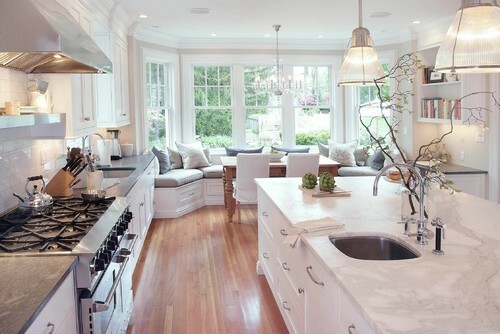 This kitchen has gorgeous pendant lights and ultra-luxe seating that you wouldn’t normally see in a kitchen. The sparkle in the backsplash and the gold-framed abstract art further emphasizes a feeling of luxury. Details in this swanky kitchen, such as the mirrored panels in the island and backsplash, along with the black marble wrapped along the top and sides of the island, are extravagant and daring. The color scheme of black, off-white, and gray is extremely classic and sophisticated. This monochrome color scheme in this warm and comforting kitchen gives off a more subdued side of luxury, while the glass pendant lights, lucite bar stools, and shell light fixture over the table ups the glam factor. 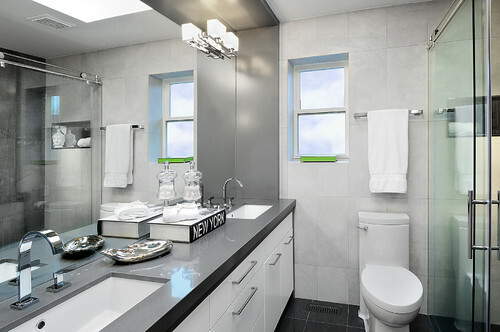 These shiny grey subway tiles, in the bathroom below, sparkle from the light and have a reflective quality. Against the stone bathtub façade, these tiles are an awesome backdrop of this jaw-dropping bathroom. Usually any room with damask patterns is a luxurious one. 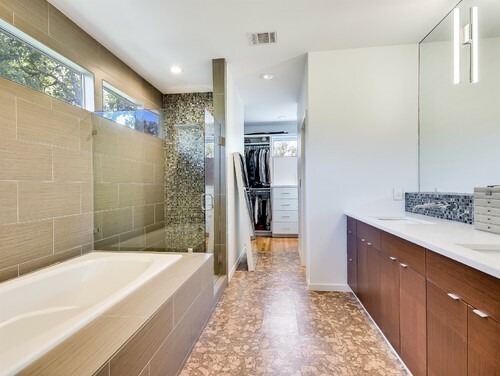 Bring in the silk window shades and mirrored vanity of this bathroom, and it’ll easily be a room your guests will never forget. The black and white color scheme and floor detail below give this stunning, contemporary bathroom a sophisticated feel. If you’re looking to make your kitchen or bathroom more luxurious, take notes from these rooms. Use deluxe materials and ultra-comfy textiles. Bring in shiny, glossy elements, whether it be wall tiles, cabinets, lighting, or accessories. Try to incorporate uncommon stones, tiles, and colors to give your room an exclusive ambience. Make sure to keep a sense of sophistication no matter what design style you choose to go with. You can’t go wrong with a black and white color scheme, but a luxurious room is one designed on bold choices… so try that color you’ve always wanted. 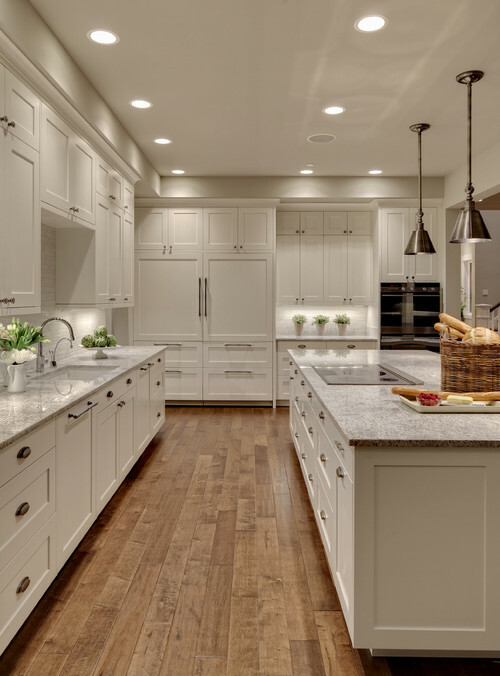 Whether you’re remodeling your entire space, or incorporating luxe elements over time, follow these tips and use these rooms as inspiration to design your own well-curated, lavish kitchen or bath. I love how fun colorful kitchens are. I always feel as if there are wonderful stories behind the people that reside in the homes of these kitchens. Like, people with colorful kitchens have to be risk-takers, creative, and cool, right? The kitchen above has lacquered green cabinets wrapped around most of the kitchen. Contrasted with the stainless countertops and stove, these cabinets have a bold, yet sophisticated, look that’s hard to ignore. Bringing in the pops of color in the books and kitchenware, helps to ground the bold color. I love how bright these cabinets are. Although there are many yellow cabinets, the expanse of stainless steel and silver in the appliances and backsplash tone down the color without it losing its impact in the room. This kitchen starts with a neutral base, but becomes colorful with the addition of the bright kitchenware. The colorful cups, bowls, and accessories set the tone for a cheery space that doesn’t take itself too seriously. This kitchen screams fun. The soft green cabinets are perfect throughout the seasons and are a great pop against the orange walls. Mixed with colorful cookware, books, and timeless elements, this kitchen is both artsy and exuberant. It’s obvious that the designer of this kitchen took precious time designing this space. Each color seems to be perfectly chosen to harmonize with the others. The contrast of the wood floor against the pastel, mint-green cabinets and cobalt-blue island brings in lots of interest, while also completing the cabinets well. So, what do you think of these colorful kitchens? Can you picture your own kitchen with any these exciting hues? If you’re like me, you love drooling over images of kitchens with seamless shelves built-in to display gorgeous dishware. But, is it practical to have open shelving in a kitchen? It depends on who you ask. Brighter, larger kitchen. 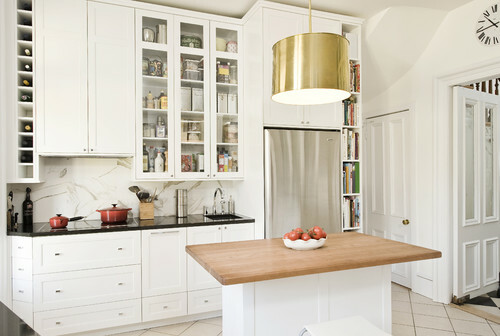 While having upper cabinets can provide more storage, removing the doors or replacing cabinets with free-standing shelves, can give the kitchen a sense of openness, while making it look brighter and feel a lot larger. Dust. One downside to open shelving is that you have to be more diligent in keeping the shelves clean and organized. Consider using your shelves to display items that would get used often. This way you’ll be able to keep a handle on any dust that could accumulate. Organization. Having open shelving can help you stay organized. By having your most used dishware on display, you’ll be forced to put items back where they belong. Display matching dishware or ones that are unique and/or pretty. Food storage. You can also use your shelves to store food in glass canisters and jars. These are great for those items that look great displayed, like pastas, beans, and rice. Inexpensive. Choosing free-standing shelves, instead of cabinets, take less time, effort, and money to install. New cabinets are pricey and usually account for a hefty percentage of kitchen renovation budgets. Open shelving on just one wall can give you extra spending money to splurge on appliances, fun kitchen gadgets, and/or gorgeous cabinet hardware. I hope you’ve gotten some ideas for incorporating free-standing shelves in your kitchen. For me, the benefits of using open shelving to make a kitchen feel bigger, more welcoming, and help keep you organized, gets me excited enough to want to install them in my own kitchen. Global design is all about worldly adventure. Imagine what a world traveler’s home would look like. Think cool trinkets from Spain, textured baskets from Morocco, a Persian rug, and silk fabric from India. To recreate this style, you can shop at flea markets and antique shops. You’ll also find unique items on EBay or Etsy’s antique market. If you travel, make sure to bring back decorative items that you love. Spaces that incorporate global design are usually very colorful. Global rooms are rich in bold designs and natural textures. The mix of different patterns and cultures make global spaces fun and interesting. Each curated piece becomes a conversation starter. Unique lines and design of global furniture ground the look of the space. Artifacts are displayed in an eclectic nature, without regards for grouping by the part of the world each piece is from. An antique African Juju hat, for example, would look great on a gallery wall next to Indian spears and French art. Organic forms, such as animal horns and rocks, add to the worldly atmosphere. Kilim rugs, unique pendants and sconces, and furniture upholstered in hide enhance the look of global design. Global design is what you make it. It’s a reflection of your travels and where you want to go. It reflects things you want to do and people you want to meet.